Home News	A week end of fire.. I did not go to China. This time I was bound to go to Silverstone to watch another race, to manage another driver and to write another story. Something went right in Shanghai with Alonso driving the perfect grand prix and finishing as the best of the rest. With Mercedes and Hamilton being so powerunitful and strong, that is the most Ferrari could hope for. The outcome of the 2014 Formula One championship is a written story, I bet. Mercedes has no reason to go backwards and everyone else has no reason to abandon hope to catch up, in vane. The gap is too huge and everyone can see Lewis and Nico to shine and the others to struggle. Ferrari and Red Bull are in for the honors, no more. For me it was a very exciting Easter week end. 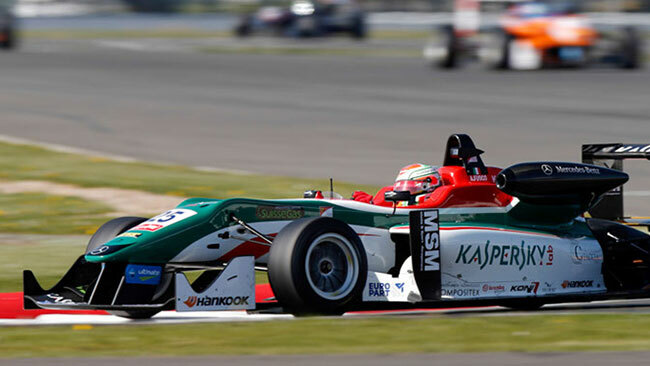 I went to the opening race of the international Formula 3 Championship to cheer my youngest driver and promising star, Antonio Fuoco. He is a great lad, full of talent and proud to belong to the Ferrari stable. In his debut, in what promises to be one of the most competitive series ever, he collected his maiden victory, five podiums and the second place in the championship, six points away from the lead. For this my story, this time, is for him. Fuoco means fire in english and the boy has a fiery attitude, shown to everyone last year when he won the 2.0 Renault Alps championship at his first season in an open wheeler. “Call him Tony Fire” said my friend Irvine when he met him in Miami over one year ago “by doing so every one will understand and remember his name as Fuoco means nothing to the english speaking crowds” And Eddie may be right, but only according to an alphabetical point of view, ‘coz Antonio is not going to stay unknown for much longer… and this is something Ferrari can really hope for.